Post-Surgery Update- All is well! 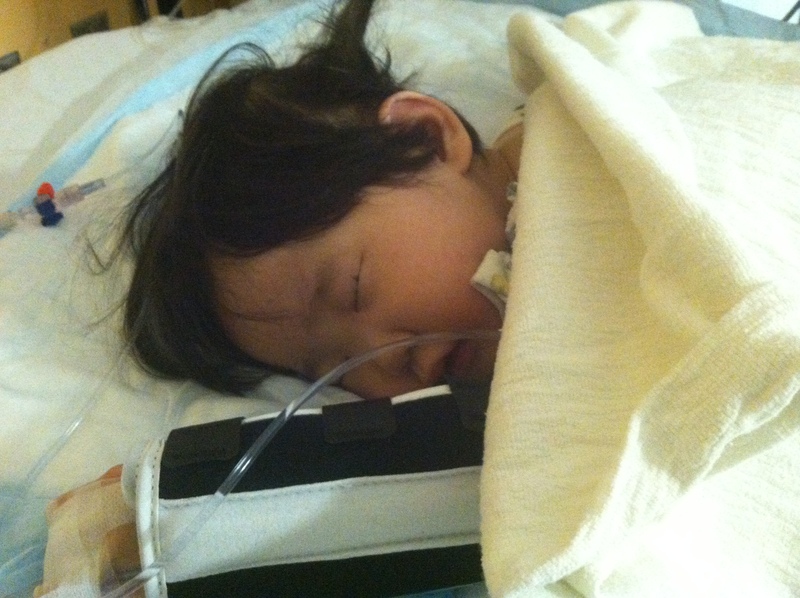 We are over a week out from Lydia’s surgery and I am thrilled to say, all is well. She is doing great, today being the first day I did not give her pain meds. She seems pain-free, except for the fact that she’s got some teeth coming in. Here is the recap of the surgery. Then we waited. We walked down the hall, got on the elevator (I had some tears), just nerves I guess. We ate some breakfast downstairs and came back up to continue to wait. We texted, read, Lars took a cat-nap and then we got a call from the surgeons about 1.5 hours later saying the stage 1 cleft repair was complete and now the ear tubes would be put in. Great news! The surgeon came out and said the surgery went well. I asked to see pictures and he showed me a picture on his camera. They made little incisions in her inner cheek to allow the uvula to come together in the back of her throat. Pretty fascinating to see. We shook the surgeons hand, said a big thank you and a wash of relief came over me. We were close to being finished. I had not been away from Lydia for this long in her waking hours and it felt strange. It was at this point that I had a revelation about recovery. I asked the Dr. could we please not put her into a crib for recovery. I knew she would freak out and, honestly anyone might, the part of the crib without bars is covered in plastic, and frankly it’s exactly like a cage. Forty five minutes later we were called again and told they would be moving her to recovery. We followed and found our little munchkin laying their peacefully in her bed. Still very much asleep. She was hooked up to lots of monitors. But her oxygen looked good and on we waited. It took probably close to 45 minutes and she started to stir, at which point I was able to get into the bed and hold her. Perfect. 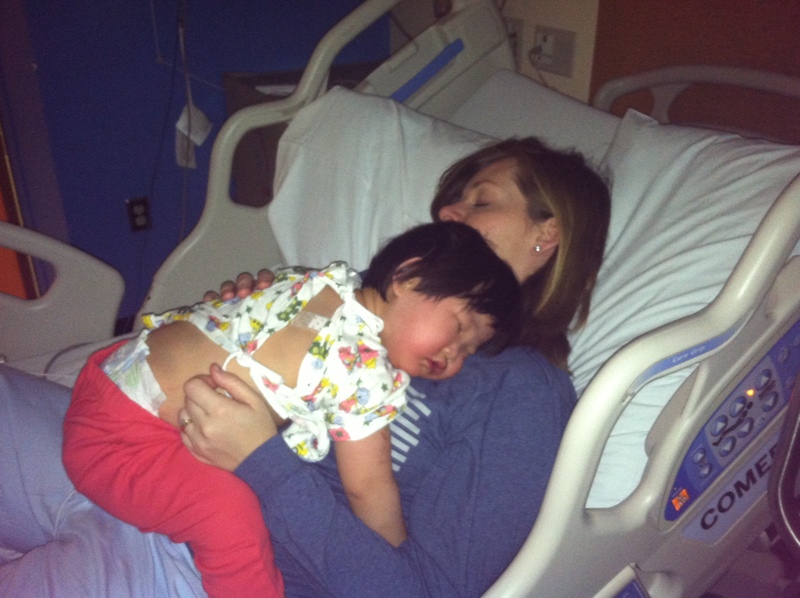 She was groggy for a very long time, but rested peacefully in my arms. We had to wait for a bed to open upstairs for nearly 2 hours… But when it finally did, we were moved their quickly and relieved to have some privacy. The nursing staff was wonderful and Lydia hardly fussed. It was now 2:45 and Lars and I ate some lunch. 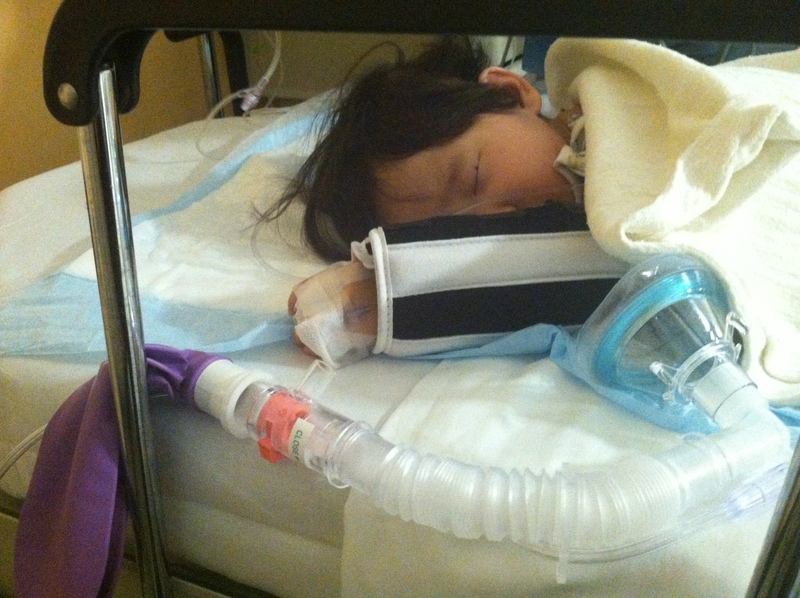 Lydia woke and fussed a bit on and off all evening and through the night, but likely from discomfort, not pain. She was medicated and all in all she was a champ! 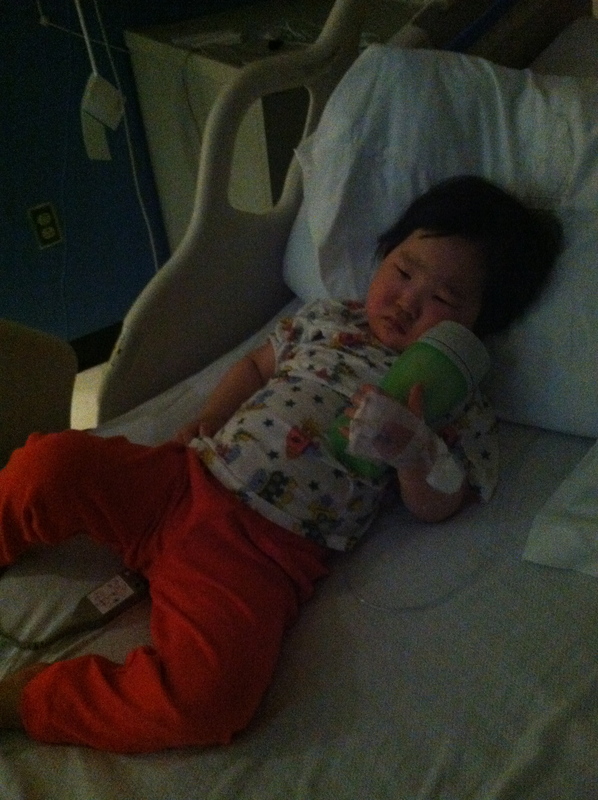 Nurses came in throughout the night to check various monitors and see how she was doing, and mainly she stayed sleepy. She did wake at 3am an wanted to drink, which was awesome. One step closer to getting to go home! And thank goodness she did so well and I didn’t need much help, because poor Lars was out of commission with some form of food poisoning, from the Au Bon Pan downstairs… Bummer. The next morning, Lydia was more awake, looking at books and wanting to eat. She ate some squeezy baby foods, the Dr. checked-in and after a bit more waiting, we got to leave around 1pm. Hurray! 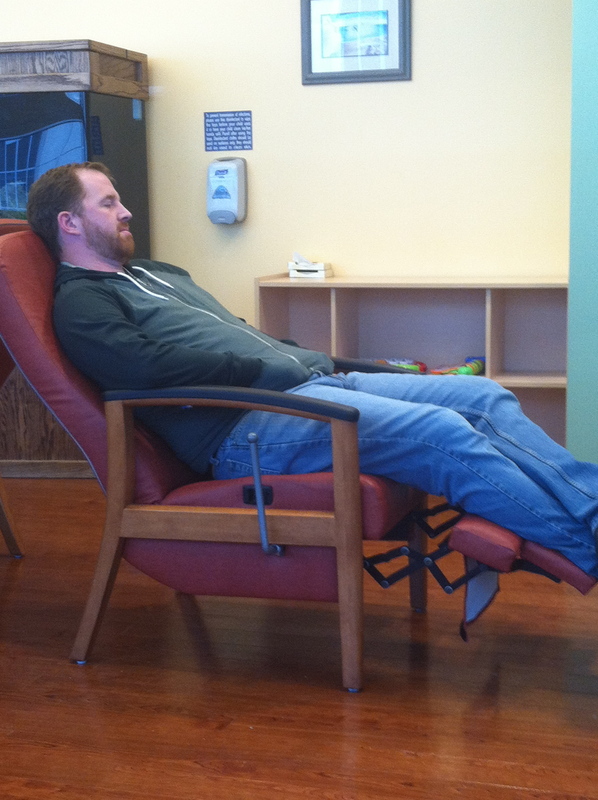 All in all, a really good experience, as hospital stays go. 🙂 Funny thing, a couple nurses commented on swelling in her face, to which I replied, nope those are just her cheeks! Seriously she wasn’t swollen. 🙂 LOVE those cheeks! Lydia’s recovery at home has included all pureed foods, which she’s sick of… And wearing little arm stabilizers that don’t allow her to bend her elbows and reach her mouth. 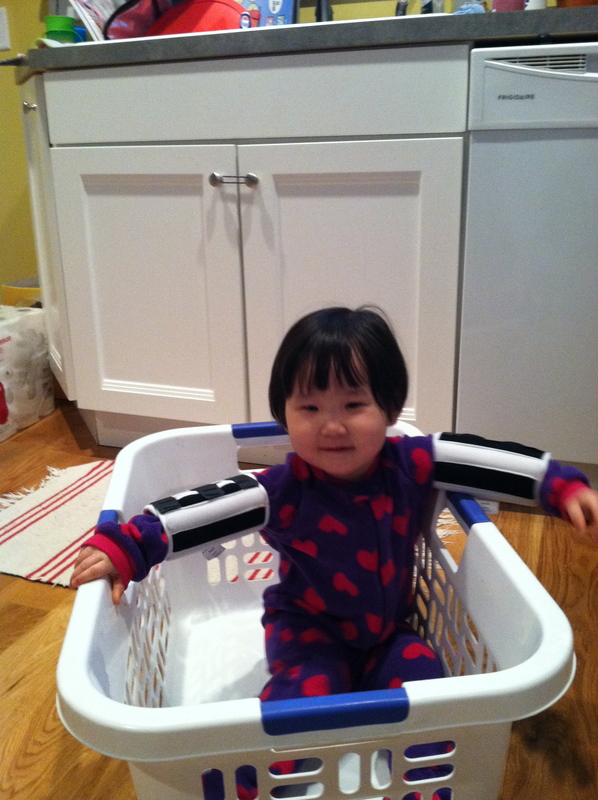 Kind of sad to see, but she manages to play just fine with robot-like arms. Her next surgery will be in the Fall, and we hope that surgery will close the opening and allow her to focus on learning to talk with the help of speech therapy. For now, we are just happy that we have one surgery behind us. One step closer to a repaired cleft. And, to think, for seventeen of the seventeen and a half months we waited for Lydia, cleft palate was not a medical condition we had said, ‘yes’ to. It was not on our list, seemed too daunting. But God knew better 🙂 and he gave us a change of heart at the perfect time. 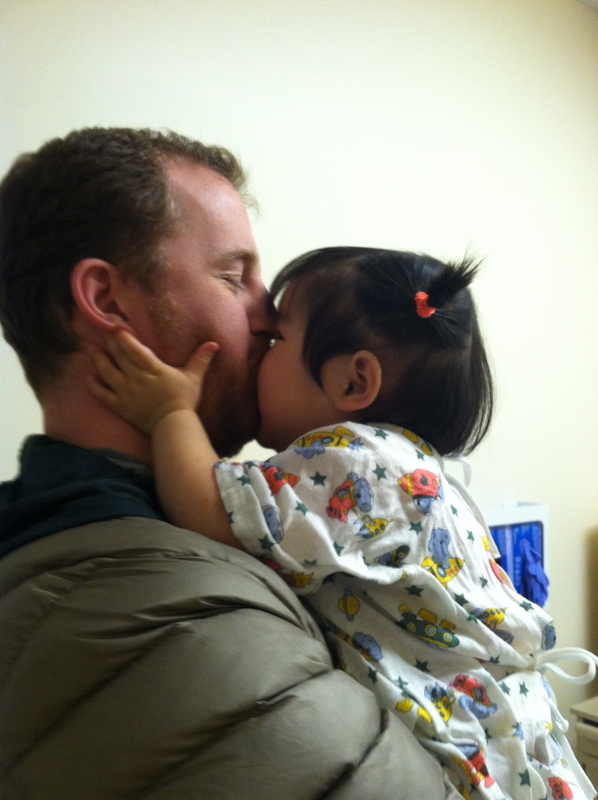 Lydia’s cleft palate, her ‘special need’ is the very thing that brought us together. So, with each surgery I will remain grateful for God’s good timing, for his good plan for Lydia’s life, and for the ‘special need’ that brought Lydia into our lives. What a sweet, little girl! I’m glad her/your surgery day went well and you and Lars could be there with her. The “big smooch” picture is prize-winning and precious. It brought tears to my eyes. I’m sorry Lars got sick, but am very glad that Lydia didn’t! Best wishes and God’s blessings on her recovery and complete healing before her follow-up surgery in the fall. 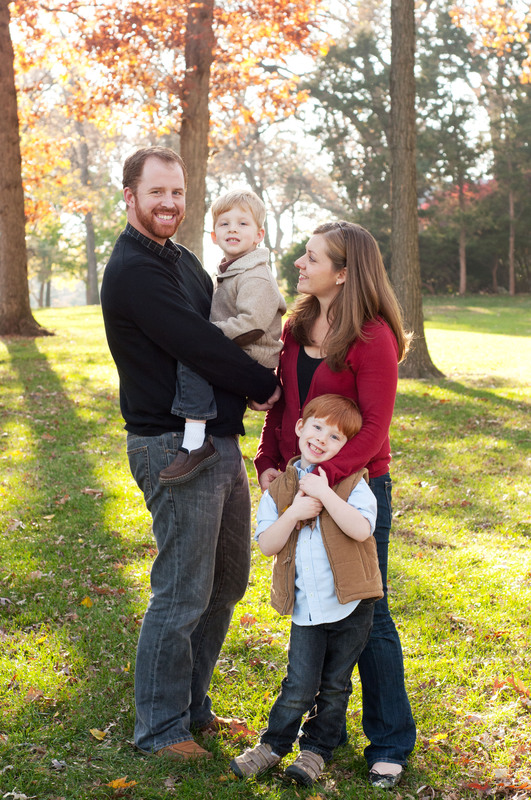 May God bless you and your whole family, too, Katie! Oh my gosh we hope the rest goes as well but what an ordeal for all of you. thank God, thank you!!!!! thank little Lydia, and nurses doctors ! thank your daddy! Thanks for sharing again. I had no idea what was involved. I’m so thankful that all went well and hope the next surgery may be her last (not sure). She has come a long way from China, right? A lucky little girl to have you two for parents.